Canadian Hydro Developers Inc. has emerged as a major player on Canada's alternative energy scene in recent years, with a portfolio of projects that includes the country's largest wind power facility-and more on the way. There might have been a bit of business serendipity at work in the development of Canada's largest wind power project, the 199.5 megawatt (MW) Melancthon EcoPower Centre, near the country's largest city, Toronto. John Keating, CEO of independent power development company Canadian Hydro Developers Inc., and his brother, Ross, were flying out of Toronto with their lawyer for a tour of one of the company's hydro electric facilities. As they were flying over Melancthon Township northwest of Toronto, their lawyer, Peter Gilchrist of Blake, Cassels & Graydon LLP, mentioned to John and Ross that he had some clients who were very serious about a wind farm in the township-and that it had the makings of a major project. Soon after, introductions were made over the phone between John Keating and Malcolm Hamilton of Chinodin Enterprises, the company proposing the wind farm. "Within a week of that, Malcolm was in my office in Calgary, showing us the maps. Ross and I went back to Ontario, had a look at things on the ground, and we struck a deal." And that is how Canada's largest wind power facility really got some traction. Keating notes that it's sometimes surprising how deals can come together. "Regardless of the type of energy you're looking to develop, that's how projects can get started," he says. "There are local entrepreneurs that will have an idea, and they know the area, the politics, and the people. But at the end of the day, these are very capital intensive projects and, as a result, these entrepreneurs are out there looking for capital at some point in the game." And we're talking about accessing some significant capital, especially at this time with the current credit crunch. The 132 MW Melancthon II project, which achieved commercial operations this past November-notably ahead of schedule and on budget-was a $285 million (Cdn) job. Melancthon II is the second phase of the Melancthon EcoPower Centre. The first 67.5 MW phase achieved commercial operations in 2006. All of the electricity and environmental attributes from the project have been sold to the Ontario Power Authority under two 20-year Renewable Energy Supply contracts. The Melancthon project is 100 percent owned and operated by Canadian Hydro Developers, which in recent years, has quietly emerged as a major player on Canada's alternative energy scene. The company has been the developer-and is the owner and operator-of 20 power generation facilities in Canada currently totaling 496 MW of capacity in operation, with another 385 MW in and nearing construction, and 1,632 MW in development. The company's renewable generation portfolio is diversified across three technologies (water, wind, and biomass) in the Canadian provinces of Ontario, Quebec, Alberta, and British Columbia. "Our business model is to have a variety of alternative energy projects," explains Keating. The company recently began commissioning the first of 86 Siemens 2.3 MW wind turbines on the 197.8 MW Wolfe Island Wind Project, in eastern Ontario. The $475 million facility, the second largest wind power project in Canada after the Melancthon project, is on target to begin commercial operations by the end of June. The site for the Melancthon wind project looked to have great potential from the get-go. The region is characterized by flat plains and is mostly farm land, but with an elevation of about 400 meters above the level of nearby Lake Huron, it is the highest point of land in southern Ontario. The region where the Melancthon wind farm is located is characterized byflat plains, and is mostly farm land. But with an elevation of about 400 meters above the level of nearby Lake Huron, it is the highest point of land in southern Ontario. Met towers had confirmed a strong wind resource-and you could see the evidence. "You know when you drive through an area, and you can see the trees sloping off to one direction, usually eastward or to the northeast, that you have a windy environment," says Keating. One of the big assets of the Melancthon project was its access to the grid. Chinodin Enterprises had already secured up to 240 MW of capacity on a nearby Hydro One transmission line that runs just south of the site, from a nearby nuclear power plant. The local entrepreneurs behind Chinodin Enterprises, who started the project, stayed involved, helping out with landowners and government in the area. Chinodin, by the way, is Ojibway for "Big Wind." On the power purchase front, Canadian Hydro bid the first phase into a renewable energy Request For Proposals by Ontario Power Authority-with 67 MW of wind power-and won the bid. "Within six months, we had it fully permitted and were building phase one," says Keating. This consisted of 45 1.5 MW GE wind turbines. "It came together quickly. Within a year, we had that phase completed." Keating said he was not surprised how quickly things came together with the first phase. But the 132MW second phase was a bit of a different story. "What surprised us was how difficult it became to permit the second phase of Melancthon-as well as other projects in Ontario-and how much the red tape had increased in getting green power projects to the construction-ready phase." The Canadian wind power industry has "barely scratched the surface" in terms of tapping the country's potential, says John Keating, CEO of Canadian Hydro Developers, which developed the 199.5 megawatt (MW) Melancthon EcoPower Centre in Ontario. Keating refers to a recently released study from the Canadian Wind Energy Association that shows that Canada could grow from its current 2,000 MW of installed capacity to 25,000 MW by 2025. "All of Canada has around 130,000 MW of installed power capacity, and 25,000 MW of wind power is estimated to be acceptable with the existing grid among all the provinces. There would not be a whole lot of grid infrastructure changes required." Keating sees the biggest challenges going forward being that wind power is variable, and it can't be stored. "But that might resolve itself," he notes. "If transportation fuels are displaced by electricity and electric vehicles, every electric vehicle that gets plugged in becomes a battery, or storage unit. Combined, that represents a huge storage facility in itself. That could allow a much greater penetration of wind energy into our grid." That aside, Keating also feels that if government and industry invested sufficient capital into energy storage research-as they are for carbon capture for coal fired power plants-"I know we could crack that nut." Some of that had to do with increasing concern over First Nations land rights in the province, but it was also related to working through increased regulations in three levels of government-municipal, provincial, and federal. "The second phase of Melancthon took a lot longer and was more complicated," Keating says. "There was also some opposition to the second phase. We were able to deal with that and overcome it, but it took an extra year." In spite of some local opposition, the project had the support of the township council, and Keating noted it was championed by Garry Matthews, then-mayor of the Township of Melancthon. Local buy-in for a wind power project is just plain essential these days, says Keating. "That's an absolutely crucial ingredient-you just don't get a project built without that local support." They sought stakeholder support through a number of open houses and public meetings on the project, with the company emphasizing that a full environmental assessment had been carried out. "We work to incorporate local concerns as much as we can. At the end of the day, we believe we end up with what we think is a better power project." 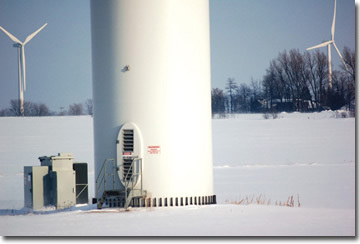 Phases one and two of the Melancthon projects involved a total of 133 1.5 MW GE turbines, and Canadian Hydro worked closely with more than 50 landowners on issues such as turbine siting. Most of these individuals had smaller landholdings, in the range of 100 acres. "Our teams sat down at every single kitchen table-some of them more than once-in their homes, to make sure the turbine location was exactly where the landowner felt comfortable." In addition to putting the turbines in the optimal location for landowners, they had other considerations in mapping out the site, such as the location of residences-with mandated setbacks for sound and flicker-wetland considerations and the location of forested areas. The company also wanted to make the best use of the existing road system. All of this works to narrow down the options, Keating says. "If you take out or consider all those constraints on your site map, you will end up with maybe 15 or 20 percent of the total land that is actually available to site turbines." There was good road infrastructure in place prior to building the project, but they still had to build about 25 kilometers of road to get access to properties and turbine sites. "Typically in this area, there is a road going across the front of a parcel of land, and that's where the residence is. In order to put a wind turbine on a 100 acre property, you have to go towards the back of the property for the turbine site-you have to be 400 meters away from the house." To access the site, they typically built a wide access road to accommodate the heavy equipment, such as transport trucks with wind towers and the large cranes for the erection work. After the turbines were in place, they generally went back and narrowed these roads. "The big work has been done at that point," explains Keating, "all we need to do after that is get in there to do some servicing. "Some of the farmers wanted the road left wide-and we'd give them the option. If they wanted it left wide, we'd pay them what it otherwise would have cost us to narrow the road and reclaim the land." 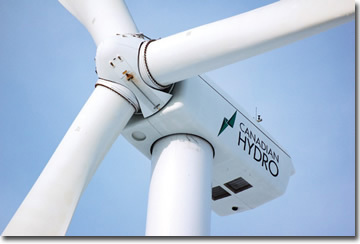 In terms of the actual construction of the wind farm, Canadian Hydro has a business relationship with a Calgary-based company, Canadian Projects Limited, that handles the construction management on projects. Keating emphasizes, however, that for all their power projects, they source whatever they can locally. "As we have throughout our history, and one of the reasons I feel that we fit well within the communities where we are operating, is we take a very long term perspective, and we generally hire local-whether it's the supply of gravel, concrete, or rebar or the guys doing the forming and laying the cable in the ground. The contracts for all of that were let locally." Having done a number of these projects before, Canadian Hydro has its own in-house expertise in the fast-growing wind power area. "We've built up a lot of capability on the front end of the process, in environmental permitting for example." Though there are a couple of exceptions, most of the projects, wind power and others, are all solely owned by Canadian Hydro Developers. And there is a very straightforward reason for that, says Keating. "I like to keep it simple," he says. "We are working with relatively low risk projects so if you can get a project permitted, ready to go, and organized, then you're better off just doing it and having one company-ourselves-involved. It's a lot more efficient, even making changes from a design perspective, making changes on the fly when you run into problems in the field." Keating notes, however, that the three joint venture projects the company has done have worked well, and there were strategic reasons for opting for these joint ventures at the time. 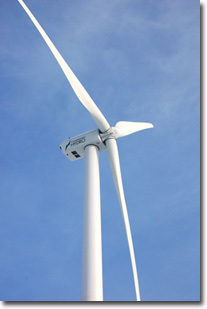 The company manages business risk by being involved in a variety of renewable energy projects, in a number of locations. "On a portfolio basis, our risk is much reduced," says Keating. "We have diversification in the type and number of projects we have, and where they are." There is a considerable advantage to that when they are getting their debt rated, especially in the current, tight credit markets. "That diversification approach increases our credit rating, reduces our cost of borrowing and, overall, makes us more competitive." Reflecting the diversification, the company is organized along three operating divisions-hydro, wind, and biomass. There is a manager for each division, as well as the necessary field operations and technical staff. "We also have a technical services division with electrical and mechanical engineers, which can focus its efforts on a wind project this week and a hydro project next week, as required." They also have an IT group that has evolved over time and is involved at the field level, as well as at the head office in Calgary and branch offices. The general approach among employees at the company is more of a pitch-in where we're needed, rather than sticking to their divisions. "In Alberta, we have two people who run four hydro plants, and they are also available to help the wind guys during the semi-annual maintenance on the turbines. And vice-versa-if the hydro guys need extra manpower, they call on the wind guys. We're all one group." And that group as a whole is going to be busy going forward. The Canadian alternative energy industry was hoping for increased incentives for wind power in the recently announced Canadian budget-similar to incentives that U.S. President Barack Obama has put in place. That did not happen, however. But alternative energy, including wind power, still has the support of the federal government and strong support from provincial governments. The government of Ontario has aggressively targeted 2014 to get off all coal fired power facilities. Keating notes that there is no lack of potential for wind power in Canada, some of which could be tapped for export to the United States. "Canada can make a significant contribution to getting North America off a dependence on foreign oil. Energy security is a big issue in the U.S., and Canada can assist the U.S. in that regard."